Football season is in full swing. Go team! 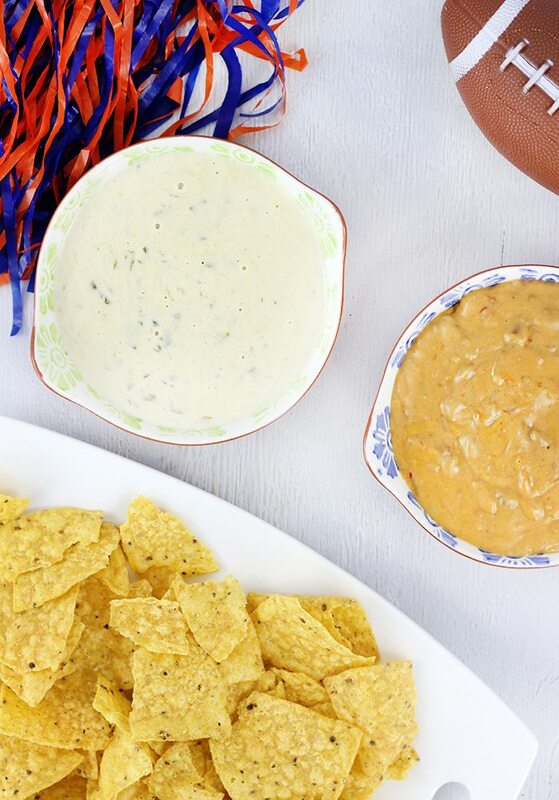 Dips and wings are among some of the very best foods for sharing on game day. Don’t you agree? Imagine being able to make your entire game day spread right in your Crock-Pot® Slow Cooker? Score! 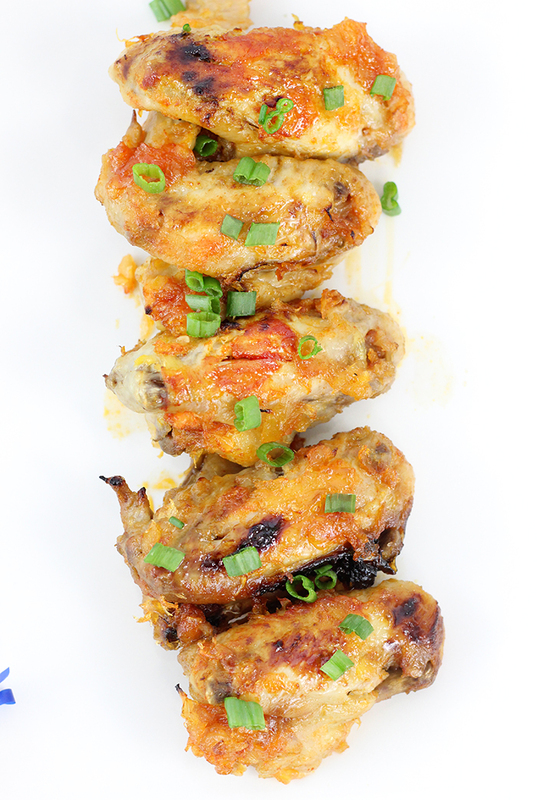 These Pineapple Sriracha Chicken Wings and dip ideas will make big games more tasty and fun. This post is sponsored by Mirum and Crock-Pot® brand, all opinions are my own. When you are serving a crowd for parties, game days and holidays, the Crock-Pot® Swing and Serve™ Slow Cooker is a huge asset. You can cook or warm three different dishes, appetizers or dips at one time. I’m loving it! I used this handy appliance to make everything I’m sharing today from tasty chicken wings to simple dips that are perfect for sharing. 15 oz jar of nacho cheese dip & 1 can of refried beans. 15 oz jar of white queso & 1 can of green chiles. The options are endless. You almost can’t go wrong no matter which dip ingredients you choose. Warm them for about 30 minutes and you’ll have creamy dip perfection. 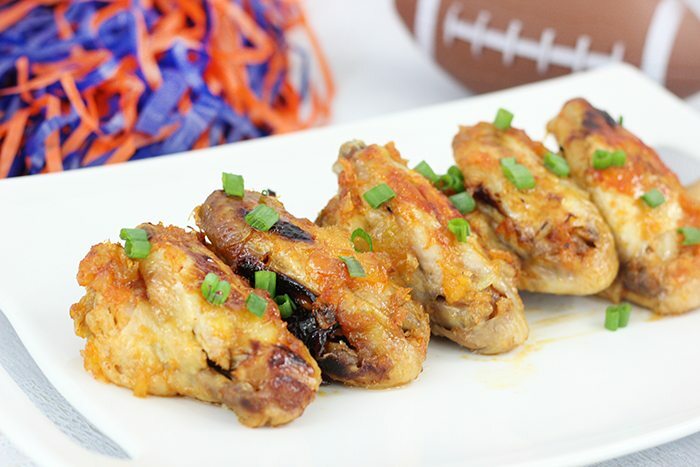 Making a batch of chicken wings for game day is a great idea. Slow cooking them makes them juicy and the chicken practically falls off the bone. This recipe is simple and tasty, the smell will lure your football loving family or guests right over. Ingredients liek crushed pineapple and sriracha sauce make this recipe pop. Add chicken wings to the Crock-Pot® Slow Cooker and pour crushed pineapple with juices on top. Cook on high for 2.5 hours. While the chicken is cooking, mix sriracha sauce and pineapple topping. After the chicken is cooked, drain the juices leaving a small amount behind, evenly pour the mixture over the chicken. Cook for another 30 minutes. Broil chicken for about 5 minutes if desired. Get more Crock-Pot® Slow Cooker recipes to create something delicious today. What would you make in a Crock-Pot® Swing and Serve™ Slow Cooker for game day? Now this is a recipe I could get behind! I love anything spicy and anything that goes into the slow cooker. These look and sound amazing. And I love using my slow cooker so I will definitely try these! I love using the slow cooker! It's perfect for football parties so I can enjoy the game while my food is cooking. Chicken wings are my weakness!! With football season here these look like the perfect Sunday food.